Often you won’t need this flexibility, a Lens' takes 2 parameters, and can be used directly as a Lens. You can also use this for generic programming. Combinators are included that are based on Neil Mitchell’s uniplate, but which have been generalized to work on or as lenses, folds, and traversals. Make the instances for Product and (:*:) in Control.Lens.Tuple poly-kinded. Make the definitions in GHC.Generics.Lens poly-kinded. Make (%%@~), (%%@=), (<%@=), and (<<%@=) consume an Over (Indexed i) instead of an IndexedLensLike i to improve type inference. Add an AsEmpty instance for ZipList. Re-export (<&>) from Data.Functor on base-4.11 and later. Fix a bug in which makeFields would generate equality constraints for field types involving data families, which are unnecessary. Improve the performance of holesOf. The Semigroup instances for Traversed and Sequenced are now more constrained (going from Apply to Applicative and Monad, respectively). In GHC 8.4, Semigroup is a superclass of Monoid, therefore we’d need to have Apply constraint in the Monoid instances. We opted to weaken our ability to use Apply than to lose compatibility with third-party packages that don’t supply instances for Apply. and similarly for forOf_ and sequenceOf_. As part of this change, new combinators traverse1Of_, for1Of_ and sequence1Of_ were added for Apply-only effects. Similar instance context changes were made for Folding and Effect, but these changes aren’t publicly visible. Add Control.Lens.Unsound, which exports unsound functionality for forming products of lenses and sums of prisms. Add Numeric.Natural.Lens, which export convenient isomorphisms for natural numbers. Add Strict instances for strict and lazy ST. Adapt Language.Haskell.TH.Lens for template-haskell-2.13 (bundled with GHC 8.4). Add Semigroup and Monoid instances for Indexing. This requires enabling the UndecidableInstances extension, so this trick is only employed when a field’s type contains a type family application. declareFields now avoids creating duplicate field classes that are shared among multiple datatypes within the same invocation. The Template Haskell machinery will no longer generate optics for fields whose types mention existentially quantified type variables. Generalized types of transformMOf, transformOf, transformMOnOf, transformOnOf, rewriteMOf, rewriteOf, rewriteMOnOf and rewriteOnOf. Add makeFieldsNoPrefix, a variant of makeFields which gives the desired behavior in the presence of DuplicateRecordFields. Also add classUnderscoreNoPrefixFields and classUnderscoreNoPrefixNamer, the corresponding LensRules and FieldNamer, respectively. Add moral Functor constraint for to ito ilike ilike to allow the “indented” type signature using Getter with redundant warnings turned on. Remove Cons and Snoc instances for NonEmpty. Modified to enable the doctests to build with stack. Better support for Closed from profunctors. Reexported traverseBy and sequenceBy from reflection 2.1. Modified the signatures of alaf and auf to work with a Functor rather than a Profunctor and rather drastically generalized them. Renamed coerced to phantasm to get it out of the way. Incorporated a bug fix for foldByOf and foldMapByOf to actually let them work on folds. The Simple type alias is now poly-kinded. This lets you use Simple Field1 s a and the like in constraints. Give cosmosOn a more general type. Added cosmos, cosmosOf, cosmosOn, cosmosOnOf to Control.Lens.Plated. Proper profunctors 5.1 support. This extended the superclass constraints for Conjoined, so it resulted in a major version bump. Added elemIndexOf, elemIndicesOf, findIndexOf, and findIndicesOf. Fixed Ixed instance for Tree. It no longer drops nodes prior to the traversed node. 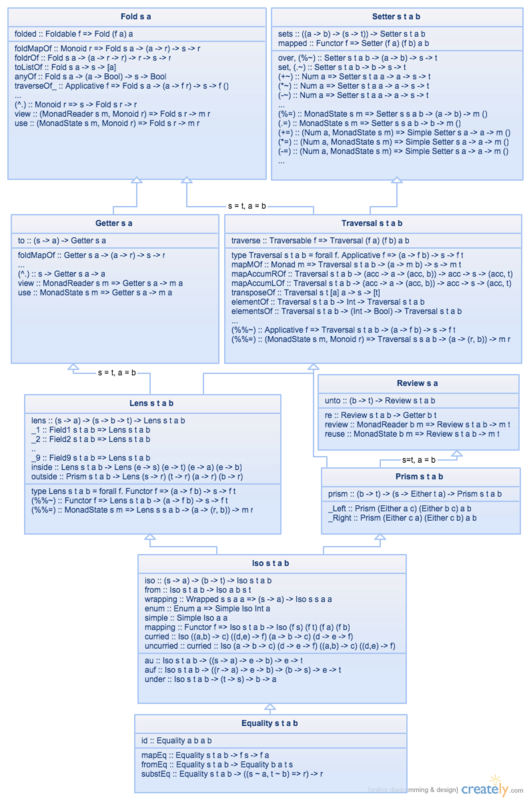 bifunctors 5, profunctors 5 and semigroupoids 5 support. Added _Wrapped support for NonEmpty. Added _Wrapped support for Alt. Fixed Rewrapped instance for Last. Removed Control.Monad.Primitive.Lens and shed the primitive dependency. Much more code is inferred Safe rather than Trustworthy. Documented the difference between unsafeSingular and singular. folding now produces an actual Fold. Cleaned up builds for GHC 7.10 to get rid of redundant import warnings. When built with profunctors 4.4 on GHC 7.8+ we no longer need to use unsafeCoerce at all! This drastically reduces the level of trust involved in the way we have optimized lens. Added fusing. This optimizes long Lens chains, by enfocing a form of fmap fusion based on the Yoneda lemma. This is particularly effective at making faster lenses the definition is recursive or complex enough that it cannot be inlined. Added confusing. This optimizes long Traversal chains. As with fusing it is best used when the definition for the Traversal chain in question is recursive or complex enough that it cannot be inlined, but the implementation is much more confusing. Add generateLazyPatterns configuration flag to makeLenses rules. Added Data.Vector.Generic.Lens.vectorIx function for indexing vectors with only Vector constraint. Added Field1 and Field2 instances for Data.Functor.Product.Product. Removed the “typeclass synonym” Gettable. Added new flag to makeLenses, generateUpdateableOptics, which allows the generation of only Getters and Folds. This feature is intended to be used when the constructors are hidden behind validating, “smart” constructors. Reduced Review to two arguments, like Getter. Added abbreviatedFields to permit makeFieldsWith to be invoked with an argument that lets it act like it did pre-4.5 and accept arbitrary common prefixes. Provide access to the typename in lensRules naming function. makeFields camelcasing rules now properly support types with camelcasing. MyType with field myTypeFieldA generates fieldA now. Previously the prefix ignore capitalization and the field would need to be named mytypeFieldA. makeClassy works on types even when none of the fields would generate optics. Added missing fixity declarations on many operators. Migrated Codec.Compression.Zlib.Lens to zlib-lens package. Restore previous default of makeFields using the camel case field namer. Internals of Template Haskell code generation rewritten. makeLenses, makeClassy, and makeFields have been unified into the same generator. TH generated single constructor Lens use irrefutable pattern matching to enable construction starting with undefined. TH generated traverals unify their field arguments (type synonyms not currently expanded) enabling exotic traversals to be generated. Reimplemented makePrisms, adding support for makeClassyPrisms, infix constructrs generate periods (.) prefixed prisms. Migrated Data.Aeson.Lens to lens-aeson package. Fixed GHC.Generics.Lens.tinplate behavior on single-field data types and empty data types. Switched the “direction” of the Iso argument to au to match the order generated by makePrisms and makeLenses. Removed makeIsos in favor of makePrisms and makeLenses. Each of these functions will construct Isos when appropriate. Removed declareIsos in favor of declarePrisms and declareLenses. Each of these functions will construct Isos when appropriate. Added matching for type-changing matches with Prisms. Added withPrism for recovering the functions passed to prism. Added negated, the isomorphism for the negate function. Added _Text isomorphisms to make the proper use with (#) more obvious and fit newer convention. When used with exceptions 0.4, throwingM will permit use with a mere MonadThrow. Generalized the types of mapping, bimapping, contramapping, dimapping, lmapping, rmapping to support changing the Functor, Bifunctor, Contravariant, and Profunctor respectively. Added Plated instances for various free monad variants. Removed dependency on constraints. It was used in a pre-release version of 4.0 but never made it into 4.0, but the dependency had remained around complicating builds for GHC 7.4.
makeLenses attempt to make the accessors it can under existential quantification. Experimental support for parallel builds on GHC 7.8 with cabal install lens -fj. Due to at last one known issue with GHC, it isn’t recommended to use this option when rebuilding lens, as a race condition on at least one platform has been seen in the wild. Added RoleAnnotations for GHC 7.8.1. These rule out a few user-accessible bottoms that could be caused by creative abuse of the new Coercible machinery. However, there was no unsafeCoerce exposed. Removed some impossible cases that required unwritable instances from the example doctypes. Restored correct behavior of makePrism on types with a single constructor. makeLenses now generates Getters and Folds on universally quantified fields. Fixed random segfaulting when using foldMapBy. Properly bundled the modules needed for the properties test suite into the tarball for hackage. Removed the dependency on cpphs. Added failing and ifailing to Control.Lens.Traversal. Changed the signature of Data.List.Split.Lens.condensing due to the addition of DropBlankFields to Data.List.Split.CondensePolicy in split. Simplified Each, Ixed, and Contains. They are no longer indexed. The previous design was actively getting in the way of user-defined instances. Replaced more of our home-grown types with standard ones. They had previously been defined to help make more intelligible error messages, but when we switched to using (Contravariant f, Functor f) instead of (Gettable f), these ceased to really help. Now you can define even more lens-compatible types (e.g. Getter and Fold) without depending on lens. Replaced the use of Accessor with Const. Replaced the use of Mutator with Identity. Replaced the use of Reviewed with Tagged. Removed the deprecated Control.Lens.Simple module. Repurposed Control.Lens.Combinators to re-export Control.Lens sans any operators; previous residents rehomed to Control.Lens.Lens. Added Control.Lens.Operators to export just the operators. Varying your import styles between these supports many qualified usage scenarios. Simplified Cons and Snoc. Now they must be a Prism. Simplified Contains. This necessitated losing many instancs of Contains, but makes it much easier and more consistent to use and instantiate. Simplified the types in System.IO.Error.Lens. We’re exiling Control.Lens.Zipper to a separate package. This will let the design for it iterate faster and let us explore the trade-offs between the 3.8 style and the 3.9 style of zippers. Switched to a new Typeable version of reflection for the harder combinators in Control.Exception.Lens. This enables us to comply with GHC 7.7’s ban on hand-written Typeable instances. Added Control.Lens.Extras for the combinator names we don’t have the gall to claim outright, but which are consistent with the rest. Renamed the constructors for ReifiedLens, etc. to just be the name of their base type. Added many many missing instances for ReifiedFold and ReifiedGetter. This permits things like runFold ((,) <$> Fold (traverse._1) <*> Fold (traverse._2)) to be a Fold and ReifiedFold can be used as a Monad, Profunctor, etc. Added types for working with RelevantFold and RelevantTraversal. These are a Fold or Traversal that always has at least one target. Since Apply isn’t a superclass of Applicative, you occasionally need to convert between them, but it lets you more readily work with less unsafety. Changed unwrapping and wrapping to have the same constructor-oriented order as a Prism and renamed them t _Wrapping and _Unwrapping respectively. Drastically changed the way _Wrapping and _Unwrapping are built to get much better inference. There are about 15,000 lines of patches over the last year, so I’m sure we missed a few big changes. Switched to bifunctors, comonad, profunctors, and semigroupoids 4.0. Generalized signatures for throwing and throwingM. Bumped dependency on generic-deriving again. Bumped dependency on generic-deriving to enable building on GHC HEAD. Updated the field guide image to link to imgur. Sadly the overview haddock and the haddocks are not generated in the same directory, so the haddock hook for copying the image only works locally. Changed Getting to take 3 arguments instead of 5. If you need the old behavior for portability you can use Overloaded (Accessor r) s t a b instead of Getting r s t a b and it’ll work consistently back through the last few releases. Factored out a common reversed definition from all the various forms of it around the library and placed it in Control.Lens.Iso. Added binary, octal, decimal and hex to Numeric.Lens. Reimplemented Gettable as an alias for Contravariant and Functor together to derive Getter and Fold. This means you can now implement a Getter or Fold with only a Haskell 98 dependency (contravariant). Removed Reviewable. We now use Bifunctor and Profunctor together to derive Review. This means you can now implement a Review with Haskell 98 dependencies (profunctors and bifunctors). These changes enables more types to be defined without incurring a dependency on the lens package. Fixes to dependencies and pragmas. Fixed an issue with DefaultSignatures being used outside of the appropriate #ifdef that caused compilation issues on GHC 7.0.2. Added \_Void and only to Control.Lens.Prism and devoid to Control.Lens.Lens. Added devoid and united to Control.Lens.Lens. Fixed more sporadic issues in doctests, caused by carrying flags from $setup between modules. Renamed strippingPrefix to prefixed, strippingSuffix to suffixed. Left the old names as deprecated aliases. Fixed issues with the test suite caused by doctests carrying flags from the $setup block between modules. Benchmarks now use generic-deriving rather than ghc-prim directly, like the rest of the package. Added Generics.Deriving.Lens, which is now simply re-exported from GHC.Generics.Lens. Added (#) as an infix form of review to ease using a Prism like a smart constructor in Control.Lens.Review. Added a notion of Handleable(handler, handler_) to Control.Exception.Lens to facilitate constructing a Handler from an arbitrary Fold or Prism. Added a notion of Handler and catches to and Control.Monad.Error.Lens to mirror the Control.Exception and Control.Monad.CatchIO constructions. Added additional doctests and documentation. Improved error messages and support for types with arguments in makeFields. Fixed a bug in makeFields in hierarchical modules. Fixed an issue with running the doctests test suite when an older version of semigroups is installed. Replaced each of the different SimpleFoo type aliases with Foo' throughout. The various Simple aliases can still be found in Control.Lens.Simple but are now deprecated. Made sweeping changes to Iso and Prism and Indexed lenses internally. They are now based on profunctors. This affects how you use indexed in the resulting code and dramatically changed the meaning of Overloaded. Generalized combinators to pass through indices unmodified wherever possible and added indexed variants to existing combinators. There are hundreds of these changes and they would swamp this list. This module was created to add combinators and prisms that make it possible to work with GHC’s extensible exceptions and monad transformer stacks more easily. There are knock-on changes in Data.Dynamic.Lens, System.Exit.Lens, and System.IO.Error.Lens. Moved At(at) and Contains(contains) and factored out Ixed(ix). Removed various ordinal and ix combinators, which are subsumed by Ixed(ix). Consoldiated the various _head, _tail, _init and _last traversals that were scattered around the place into a pair of Cons and Snoc classes that provide _Cons and _Snoc prisms respectively, and combinators that build on top. Generalized the signature of Each to permit it to provide an IndexedSetter for ((->) e). Each now uses an Index type family that is shared with At, Ixed and Contains to indicate these operations are related. Added as a stronger form of Iso that can be used to safely cast. Added the adverb simply, which can be used to simplify the types of most combinators in the library so they only take a simple lens, simple traversal, etc as their first argument instead. e.g. simply view forces a ~ b, s ~ t in the argument to view. The various indexed combinators for each type were distributed to their respective modules. This module grew to encompass the remaining index-specifics. Added index and indices, and removed iwhere and iwhereOf. Use itraversed.indices even and bar.indices (>3) instead. This module was exploded into more manageable component modules. Strict(strict) is now a Simple Iso. Added magma and imagma which can be used to provide a ‘debugging view’ of a Traversal. Restructuring split this module out from Control.Lens.Type and merged the contents Control.Lens.IndexedLens. This module was created to provide the breadth-first-search Traversals levels and ilevels which can be used to do (optionally depth-limited) breadth-first searches through arbitrary traversals reaching all leaves at finite depth in finite time. To use these in full accordance with the laws you should restrict yourself to commutative operations and finite containers, but they are useful even in the absence of these properties. In the interest of consistency, the Loupe alias has been deprecated in favor of ALens. Loupe (and ALens) are now defined in terms of Pretext rather than Context. This permits them to be cloned at a reduced cost reducing the call for ReifiedLens. Added this module for users who insist on qualified use, but want access to the operators. They can import qualified Control.Lens as Lens and import Control.Lens.Operators unqualified. Added prism' to construct SimplePrisms. Consolidated the various ReifiedFoo definitions into one module. This module was removed. Its functionality may be split out into a separate package, but currently the linear package exports is own Linear.Core module to provide this functionality. It was taking lots of useful names for little functionality and didn’t feel like the rest of the API. This module now factors the review functionality out of Prism and exposes unto, which is to review what to is to view. Added contramapped and argument for mapping over inputs. Removed the infix lens aliases and repurposed the module to house the now deprecated SimpleFoo type aliases, which were replaced universally with Foo'. Added makePrisms as a generalized makeIso that automatically generates a Prism for each constructor. makePrisms generates names with an _Foo convention. This was consolidated upon throughout the library to reduce namespace conflicts between prisms and lenses. Added makeFields, which generates classes for each individual field in a data type. Added makeWrapped, which automatically generates a Wrapped instance for a newtype. Added wrapped' and unwrapped' for scenarios where you need the help with type inference. Converted Zipper to walk a magma based on the original structure and to use indices from indexed traversals when restoring from tape. This also means that when zipping around within a balanced structure with ascending keys moveTo can operate in logarithmic time, but required changing the Zipper type to add the index type. Data.ByteString.Lazy.Lens now uses Int64-based indexing. The Traversal for strict ByteStrings now construct a balanced tree up to a given grain size. This permits zipper based seeking to operate in logarithmic time and speeds up many traversals. Created. base shows and reads integers at base-2 through base-36. integral can be used as a safe fromInteger/toInteger. Fixed an issue with the Complex Each instance. Backported the API for ALens and ALens' to support snap builds on old platforms. Removed my intra-package dependency upper bounds for my own packages. In particular this enables us to work with semigroups 0.9. Switched to transformers-compat to avoid having unbuilding modules at the top of the documentation, and to ease 3rd party compatibility. Bug fix for Magnify. It was missing functional dependencies to determine its k parameter from m or n.
Made the doctest test suite hide all but the exact versions of packages used to build this package to avoid problems with complicated user environments. Removed doctests based on :t as they are fragile and break across GHC versions. Fixed GHC 7.0.4 compatibility by guarding DefaultSignatures in Control.Lens.Each. Added Each(each) to Control.Lens.Each for indexed traversal of potentially monomorphic containers. Added indexing64 and traversed64 for help with large containers. Generalized the type signature of choosing. Fixed flagging for Safe Haskell. Cleaned up the statement of the Prism laws. Fixed compatibility with Haskell Platform 2011.4.0.0 – you may have to install with –constraint=“transformers = 0.2.2.0” to avoid getting new mtl and transformer versions installed. Implemented a complete redesign of the way Iso and Prism are handled internally. Any Iso can now be used as a Prism. The isos combinator is no longer required. iso can now be used to construct an Iso. Changes to the signature of from and under were necessitated by the new design. Added Control.Lens.Wrapped providing a canonical isomorphism for newtypes. Repurposed ala to be closer to the original design in newtype, but added au and alaf. Added _magnitude, _phase and _conjugate to Data.Complex.Lens. Renamed other lenses for consistency: _realPart, _imagPart, _polar. Promoted _left and _right to prisms and moved them to Control.Lens.Prism. Generalized view and views to subsume the old functionality of peruse and peruses. Generalized review and reviews to both return a MonadReader and to work on a Projection. Added view'/views' and use'/uses' for Simple access to the environment/state. Added set', a Simple version of set. Added reuse : use :: review : view and reuses : uses :: reviews : views for working a Projection from the current MonadState. Removed many isomorphisms for various newtypes. _const, identity, _sum, etc. Use wrapping Const, wrapping Identity, etc. Removed Data.Monoid.Lens now that its newtypes are instances of Wrapped, exporting the (<>=)-variants from Control.Lens.*. Renamed via to cloneIso for consistency. Renamed index to indexed to reduce conflicts with third-party libraries. Added curried and uncurried to Control.Lens.Iso. Added Strict(strict) for ad hoc overloading of conversions between strict and lazy variants of ByteString and Text. Bug fixes for tugTo and jerkTo. These no longer traverse in the wrong direction: scanl1Of, scanr1Of, mapAccumLOf, and mapAccumROf. Generalized the types of the Control.Lens.Zipper combinators to work with other MonadPlus instances. Added withins to Control.Lens.Zipper now that they can work better with . Added singular and unsafeSingular to Control.Lens.Traversal to assert a Traversal is a Lens, a Fold is a Getter or a MonadicFold is an Action. Generalized sequenceAOf_’s type to match sequenceA_. Renamed up/down/left/right to upward/downward/leftward/rightward to reduce conflicts – in particular with Control.Arrow. Readded leftmost and rightmost due to the verbosity of farthest leftward/farthest rightward. Added preview/previews/firstOf and deprecated headOf. We’ve generalized the type of Bazaar and provided generalized variants of partsOf, etc. that used it. Added more explicit dependencies to the doctest suite. Disabled the ‘expected failure’ quickcheck tests that occasionally would fail with internal QuickCheck errors. Added upon (along with variants of it) to Data.Data.Lens, which can be used to generate a Traversal from a field accessor or any function that returns, unmodified, a single field that would be visited by template. Added some missing examples/ files to the distribution. Removed (^!? ), which was an alias for (^?!). Removed the need for Trustworthy by changing the implementation of coerce for BazaarT. element and elementOf are now indexed traversals rather than lenses and have moved to Control.Lens.IndexedTraversal. This both fixes their former partiality and lets you use chain indexed combinators with them. Added elements and elementsOf as indexed traversals for ordinal indexing into regular traversals that generalize element and elementOf. Changed Data.Complex.Lens.polarize to a Simple Iso, due to the RealFloat constraint causing inference problems. Renamed traverseLeft and traverseRight to _left and _right respectively. Renamed traverseSlice, traverseFrom, and traverseTo in Data.Sequence.Lens to sliced, slicedFrom, and slicedTo respectively. Renamed traverseAt to _at in Control.Lens.IndexedTraversal. Renamed traverseArray to _array in Data.Array.Lens. Renamed and made the combinators in Control.Lens.Zipper more compositional to reduce third-party naming conflicts down to just left and right. Renamed &= and |= to .&.= and .|.= for consistency, mutatis mutandis their related operations. Added a Plated instances for Language.Haskell.TH types. Moved a lot of internals around. Most notably, Gettable, Settable and Effective have moved to Control.Lens.Classes. Renamed (%) to (&) and (^%) to (^&). This avoids the conflict with Data.Ratio, which was our highest priority conflict with a third party library. Removed some “isplitting” bad combinators from Control.Lens.IndexedFold. Made indexed, taking, and dropping and elementOf lazier and capable of dealing with infinite traversals and infinite folds. Improved Indexing to support infinite traversals and folds. Removed some of the more redundant combinators from Control.Lens.Plated, which already had existing aliases in the rest of the traversal API. Moved partsOf, holesOf, and elementOf into Control.Lens.Traversal. Renamed query to peruse and queries to peruses. These are much less contentious names, both contain use in their name for analogy to use and uses and the word is about reading. Added enum and non to Control.Lens.Iso. Added (^?!) to Control.Lens.Fold for unsafe access to the head of a Fold. Changed _head, _tail, _init and _last to traversals in Data.List.Lens and Data.Sequence.Lens. Eliminated traverseHead, traverseTail, traverseInit and traverseLast. partsOf and unsafePartsOf can now also be applied to a Fold yielding a Getter or to a MonadicFold yielding an Action. Redefined simple and moved it to Control.Lens.Iso. Instead of using simple l you can now compose l.simple or simple.l providing more nuanced control and a more compositional API. Moved the various foo# combinators used to emit cleaner core into an unexported module, Control.Lens.Unsafe. This removes MagicHash from the public API. Removed the bazaar# and runBazaar# coercions that caused issues on GHC HEAD. Changed the default definition of plate to uniplate from ignored. Added Data.Vector.Lens and instances for Data.Vector. Added support for the split package, which is now part of the Haskell platform. Removed redundant Data.List.traverseList. Use itraversed or traverse instead. Fixed a bug in Control.Lens.TH that was causing makeIso not to work. Added lifted to Control.Lens.Setter for mapping over monads. Removed the operators from Data.List.Lens, they broke the overall pattern of the rest of the API, and were terrible clutter. Fixed a bug that caused resultAt to give wrong answers most of the time. We’ve relinquished the name value. Made elementOf lazier and moved it from Control.Lens.Traversal to Control.Lens.Plated. Made holesOf and partsOf lazier to deal with infinite structures. Resolved issue #75. We now generate nicer core for most Setter and Fold operations, and some others. Made lenses for field access like _1, _2, etc. lazier. Added Control.Lens.Loupe, which provides a limited form of Lens that can be read from and written to and which can compose with other lenses, but can also be returned in a list or as a monadic result, but cannot be used directly for most combinators without cloning it first. It is easier to compose than a ReifiedLens, but slightly slower. Moved (:=>) and (:->) into Control.Lens.Simple, which is not exported by Control.Lens by default to reduce name conflicts with third party libraries. Simplified the type of filtered, so that it can be composed with other folds rather than be parameterized on one. Included the caveat that the new filtered is still not a legal Traversal, despite seeming to compose like one. Renamed ifiltered to ifiltering, and while it still must take an indexed lens-like as an argument, I included a similar caveat about the result not being a legal IndexedLens when given an IndexedLens. The function was renamed because its signature no longer lined up with the new filtered and the gerundive ‘-ing’ suffix has come to indicate an operator that transformers another lens/traversal/etc. into a new one. Added taking and dropping to Control.Lens.Traversal. Alpha-renamed all combinators to a new scheme. Instead of Foo a b c d, they now follow Foo s t a b. This means that you don’t need to alpha rename everything in your head to work through the examples, simplifies exposition, and uses s and t for common state monad parameters. Thanks go to Shachaf Ben-Kiki for the grunt work of slogging through hundreds of definitions by hand and with regular expressions! Restored lenses to Trustworthy status so they can be used with Safe Haskell once more. Fixed a bug in rights1 and lefts1 in Control.Lens.Zipper which would cause them to loop forever when given a 0 offset. Added ?~, <?~, ?= and <?= to Control.Lens.Setter for setting the target(s) of a Lens to Just a value. They are particularly useful when combined with at. Refined the behavior of substType in Control.Lens.TH to match the behavior of typeVarsEx when moving under binders. Added generateSignatures option to Control.Lens.TH to allow the end user to disable the generation of type signatures for the template-haskell generated lenses. This lets the user supply hand-written haddocks and more restricted signatures. Added <<~, a version of <~ that supports chaining assignment. Added :->, :=>, and :<-> as type operator aliases for Simple Lens, Simple Traversal, and Simple Iso respectively. Renamed |> to %, as %~ is the lensed version of %, and moved it to Control.Lens.Getter along with a version ^% with tighter precedence that can be interleaved with ^. Renamed merged to choosing. Added a simpler chosen operation to mirror both. Renamed traverseException to exception and traverseDynamic to dynamic, upgrading them to use Projection. makeClassy now places each generated Lens or Traversal inside the class it constructs when possible. This makes it possible for users to just export HasFoo(..), rather than have to enumerate each lens in the export list. It can only do that if it creates the class. If the createClass flag is disabled, then it will default to the old behavior. Added performs to Control.Lens.Action to mirror views in Control.Lens.Getter. Restored compatibility with GHC 7.2. This required a major version bump due to making some MPTC-based default signatures conditional. Added the missing Control.Lens.Combinators to exported-modules! Its absence was causing it not to be included on hackage. Generalized the signature of Getting, Acting and IndexedGetting to help out with the common user code scenario of needing to read and then write to change types. Documentation cleanup and additional examples. Renamed au to ala, introducing further incompatibility with the newtype package, but reducing confusion. Removed need for Data.Map.Lens and Data.IntMap.Lens by adding TraverseMin and TraverseMax to Control.Lens.IndexedTraversal. Added ++~, ++=, <++~ and <++= to Data.List.Lens in response to popular demand. Added |>, <$!> and <$! to Control.Lens.Combinators, which exports combinators that are often useful in lens-based code, but that don’t strictly involve lenses. Fixed bugs in Traversal code-generation. Added build option -f-inlining to facilitate building with the various TH 2.8 versions used by GHC 7.6 and HEAD. Added support for generating a Traversal rather than a Lens when multiple fields map to the same name or some constructors are missing a field. Removed _ from the lens names in System.FilePath.Lens. Added assign as an alias for (.=) in Control.Lens.Setter. Added Control.Lens.Plated, a port of Neil Mitchell’s uniplate that can be used on any Traversal. Added Data.Data.Lens with smart traversals that know how to avoid traversing parts of a structure that can’t contain a given type. Renamed IndexedStore to Context now that it is used in user-visible locations, and since I also use it as uniplate’s notion of a context. Compatibility with both sets of template haskell quirks for GHC 7.6.1-rc1 and the GHC 7.6.1 development head. Renamed children to branches in Data.Tree.Lens. Added At and Contains to Control.Lens.IndexedLens. Generalized the type of zoom to subsume focus. Template Haskell now uses eager binding to avoid adding dependencies. Increased lower dependency bound on mtl for cleaner installation.